Wake up the skin and provide natural colour with a radiant, healthy glow for a flawless, no-makeup look. Sheer, buildable coverage lets you customize your glow, while the modern, multidimensional matte finish imparts a hint of soft luminosity. Bronze shades provide a neutral warmth in varying intensities. The ultra-lightweight formula feels comfortable and weightless on the skin, applies smoothly and blends effortlessly. Features a smooth, silky, velvety texture and longwearing formula that lasts up to eight hours and stays colour-true without oxidizing for an even wear. Using the Bronzer Brush, lightly tap on top of domed bronzer, making sure to cover all edges of the brush with product. Tap off excess. 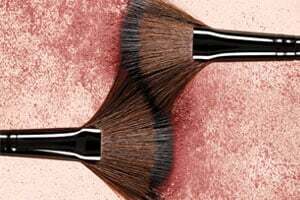 Using the tapered head of the brush, apply to areas where the sun naturally hits, like the cheeks, nose, brow bone, forehead and chin, creating a natural, sun-kissed look. Ingredients Mica (Ci 77019), Talc, Nylon-12, Dimethicone, Isopropyl Palmitate, Polysorbate 20, Acrylamide/Sodium Acryloyldimethyltaurate Copolymer, Magnesium Aluminum Silicate, Octyldodecyl Stearoyl Stearate, Cetearyl Ethylhexanoate, Isohexadecane, Caprylyl Glycol, Sorbitan Stearate, Sodium Dehydroacetate, Phenoxyethanol, Simmondsia Chinensis (Jojoba) Seed Oil, Tocopheryl Acetate, Polysorbate 80, Hexylene Glycol, Lauroyl Lysine, Sorbitan Oleate, Tin Oxide, Calcium Sodium Borosilicate, Synthetic Fluorphlogopite, Calcium Aluminum Borosilicate, Silica. May Contain (+/-): Ci 77891 (Titanium Dioxide), Ci 77491, Ci 77492, Ci 77499 (Iron Oxides).